This is the second recipe I made this week from Rachel Ray Every Day magazine. Compared to traditional quiche, sovaldi I like that the crust is made from tortillas and there are only 3 eggs. I also love using goat cheese (and feta) in recipes – you don’t have to use much to get a lot of flavor. This is a great dish for a Sunday brunch! Preheat the oven to 375. In a greased 9 inch pie plate, overlap the tortillas to make a crust; place on a rimmed baking sheet. Meanwhile, fill a large nonstick skillet a third of the way with salted water; bring to a boil. Add the asparagus and cook until crisp-tender, about 1 minute; drain, rinse in cold water and pat dry. Wipe out the skillet, add the oil, and heat over medium-high heat. Add the onions and mushrooms, season with salt and pepper and cook until the mushrooms are golden, about 3 minutes. Stir in the asparagus; season with salt and pepper. Spread evenly in the tortilla crust, then crumble the cheese on top. 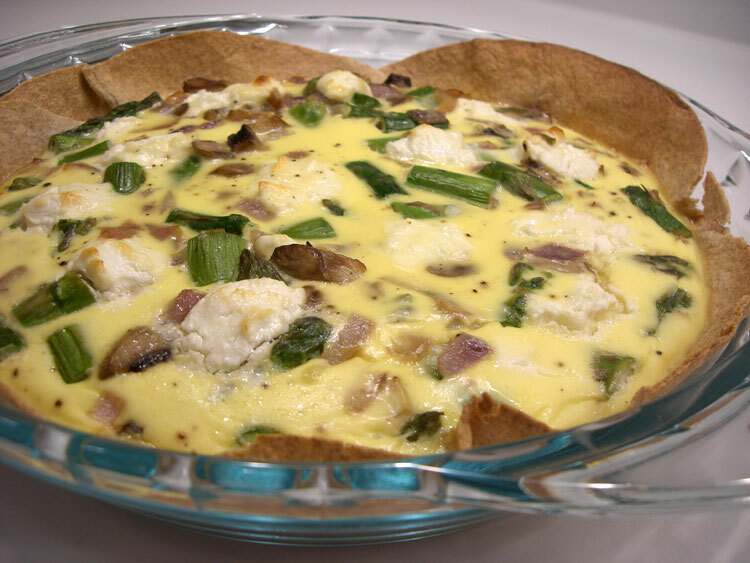 In a medium bowl, whisk the eggs and yogurt and season with salt and pepper; pour into the tortilla crust. Bake on the baking sheet until just set in the center and lightly golden, about 30 minutes. Let rest for about 10 minutes before serving.